It could be said that no two print jobs are the same. Content is obviously different, and many of the challenges that accompany a project are unique to that specific customer’s material. However, some printing challenges are fairly common across many jobs, and the effects those challenges have on prepress workflow can be pretty hard-hitting to the efficiency of a central reprographic department (CRD) operation. With today’s demands for complex documents, brand-accurate colors and a multitude of media content, these challenges are enhanced even more. Add to that the demand for tighter turnarounds, shorter run-lengths and a focus on cost control, and a CRD’s prepress workflow had better be one well-oiled machine to ensure efficient productivity. What follows are six common digital print applications and the challenges associated with them. Being able to work around these challenges will determine how profitable and efficient your operation is, but more importantly, it will determine how valuable you are to your customers. Often times the source material that goes into creating these types of products comes from multiple sources. That means a digital press operation is getting pages and images that are very likely not properly prepared for the printing process. Those pages and images will require changes, and when an operation is relying on manual labor to make those changes the job becomes far less efficient. This manual manipulation also opens the door for more errors in the final product, potentially rendering the extra labor null and void, not to mention threatening the operation’s quality assurance. It’s not uncommon to receive a file that needs updating at the last minute, such as an individual page that needs to be replaced. Also, multiple versions of the same material may need to be printed. For example, a company that offers outdoor services might distribute material highlighting dock restoration in Florida, but snow clearing services in Maine. It’s tedious tasks like these that, when done manually, can chew up a project’s prepress workflow productivity and efficiency. Often times, personalizing a document requires Variable Data Printing (VDP). Operations using VDP typically use multiple software packages, and that means a digital press operation is going to need someone who can manually organize and manage a database, not to mention who also possesses at least a basic programming knowledge. This increase in variables once again opens up a project to potentially costly mistakes and plummeting efficiency. The prepress workflow associated with printing tabbed documents is a substantially time-consuming one. The creation of the document is one thing, but the guaranteed extra work of editing and nesting requires a good amount of manual preparation and proofreading. According to research conducted by Canon, such projects previously took as long as five, 24-hour days to complete. That’s a tough efficiency hurdle to overcome. Incidentally, Canon, with its Make-Ready software, managed to knock that same job down to just three, 12-hour days. Many projects are initially created using multiple applications like Microsoft Word and PowerPoint. These types of projects inevitably come with mismatched font sizes and formats. In fact, font has been reported as the most common issue with prepress workflow delays. A study has shown that 22% of print projects have font issues when they’re received from the customer. Fonts are easily corrupted and tend to evolve over time, and the manual labor needed to fix those issues can quickly add up on a project. Printing jobs with both color and black and white pages can be more costly to complete when you rely on manual processing. Typically, black and white pages are printed on one press while the color pages are printed on a separate press, which require manual collation to operate properly. The additional requirements of this type of project and the extra manual labor it takes for setting the job up, proofing and then re-printing can quickly chop the efficiency legs out of an operation’s prepress workflow. Print projects that include content from scanned documents is a guaranteed increase in manual labor to troubleshoot issues. Scanned documents inevitably include pages that are skewed or misaligned. Those seemingly simple mistakes require a considerable amount of labor to clean up and fix. All of that spells yet another efficiency-killer for a prepress workflow. All is not lost. 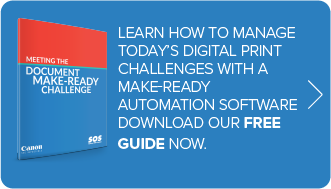 Automation has helped reduce, if not eliminate entirely, most of these challenges that digital press operations face in their prepress workflow. End-to-end software automation like Canon Make-Ready software streamlines and maximizes the efficiency potential in the print production process. The benefits of automation software are numerous, but the most important for digital press and their prepress workflow is the increase in efficiency and the potential savings it brings–pretty important given that most digital press operations attribute workflow with as much as 85% of the overall printing costs. It does this in a couple of ways. Prepress workflow activities include preflighting, finishing and tracking actual jobs. Automation that can do all of this frees up the staff to perform more value-added work. Automating prepress workflow activities helps eliminate potential errors. Any way you cut it, automated systems will make fewer errors than people. Plus, most automated systems can detect errors automatically should any happen to slip through. Automation in the prepress workflow process can also minimize project turnaround, potentially driving new business and maximizing the efficiency of an in-house digital print operation. The formula is simple; a decrease in manual work equals an increase in productivity and the ability to take on more projects. An increase in quality assurance usually comes with the automation of the prepress workflow, as well. That, in turn, makes customers happier, especially if the software happens to integrate with the tools they use as well. Finally, automated software systems are easier than ever to implement and maintain. It no longer takes a team of tech-savvy programmers to run an automation system. Now, it’s easier than ever to build highly effective prepress workflows, often with simple drag and drop features. A make-ready, end-to-end software automation like Canon Make-Ready will increase a digital press operation’s efficiency and productivity, eliminate the challenges associated with manual methods and ultimately provide the operation with the kind of prepress workflow that will exceed their clients’ goals and continue to drive the business forward.